Three strikes and you're out! Three beans and you're in--chili paradise, that is. Three different beans, vegetable "beef", and our secret blend of seasonings make this an evening favorite! Add a piece of cornbread and you'll feel like you're back on the ranch. Three strikes and you're out! Three beans and you're in--chili paradise, that is. 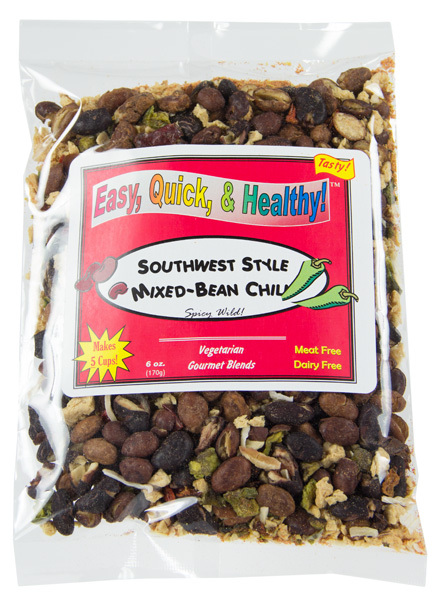 Three different beans, vegetable "beef", and our secret blend of seasonings make this an evening favorite! Add a piece of cornbread and you'll feel like you're back on the ranch. Talk about comfort food! Pour entire contents of our Southwest style chili into saucepan. Add 4 cups water and stir well to blend seasonings. Bring to a boil. Reduce heat and simmer for 10 minutes, stirring frequently. Cover, remove from heat, and let stand an additional 5 minutes. Stir gently and serve. Pour entire contents into a 1 1/2 - 2 qt. Slow Cooker. Add 4 cups water and stir. Cook slowly for 4 hours to blend flavors. Stir gently and serve. Try our preferred Rival 2 Qt. Slow Cooker. We are no strangers to using dehydrated ingredients; but, new to Harmony House Foods, which is rapidly promising to become our favorite source. Working our way through the 30-pouch sampler and the 12-pouch variety soup packs. As we go, we rank the soups, and so far, though we've liked them all, this is top ranked choice. Our goal in using dehydrated products is to be able to make right-sized meals without left-overs or waste for two oldsters with some dietary restriction (looking to reduce sodium intake without having to resort to meals that taste as if they came from the paper-products aisle). My package arrived today and I couldn't wait to try this soup. I was wary, I admit... the only dehydrated soup "meal" I'd eaten was of the "ramen" variety, and I'd never had any type of meat substitute before. To say I am pleasantly surprised is the understatement of the year. The flavor is "warm" without being too spicy, making for a delicious and comforting meal. We eat our chili over rice, and this was no exception, which made the single package quite enough for two large adult servings and two smaller children's servings. My family (including two picky eaters) was impressed, and we will definitely be buying more in the future. Click Here for the complete nutritional label. Serving Size = approximately 2/3 Cups. Entire packet yields 5 cups or 8 servings.